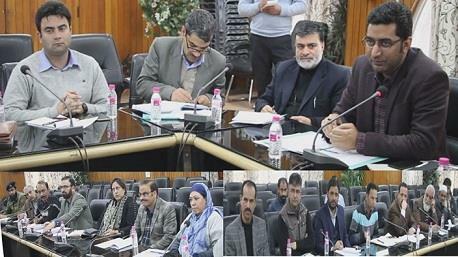 SRINAGAR, MARCH 26: Deputy Commissioner Srinagar, Dr Shahid Iqbal Choudhary, Tuesday convened a meeting to review the arrangements being made for the forthcoming Me’raj ul Alam celebrations in the district. The DC while emphasising the great reverence of the Me’raj ul Alam occasion impressed upon all the concerned departments to ensure all their respective tasks are covered with highest degrees of responsibilities. He directed the PDD and the PHE to ensure uninterrupted power and water supplies to all the major congregation sites on the occasion of Me’raj ul Alam. He instructed for provision of standby transformers and generators and mobile water tankers as a backup at these places. The Regional Transport Office and the State Road Transport Corporation were asked to ensure that there is adequate availability of transport facilities at all these places. The Traffic department was asked to prepare well-thought-out traffic management and parking plans in order to ensure hassle-free to-and-fro movement of vehicles. The Health department was asked to ensure setting up of required facilities including holding of medical camps at the locations of worship during the night long prayers of Me’raj celebrations. The DC also instructed the R&B to immediately identify and complete pot-filling wherever needed. He also directed the SMC to ensure thorough maintenance of cleanliness around the Dargah Hazratbal among other major places of worship during Me’raj celebrations. Dr Shahid said that a control room will be set up at the DC Office and directed all the concerned departments to provide all details of their respective responsibilities besides other important information for the convenience of the general public.